A strategic social initiative in Russia is making waves with its cybernetic immortality project. (2045.com)If Dmitry Itskov's 2045 initiative plays out as planned, humans will have the option of living forever with the help of machines in only 33 years. It may sound ridiculous, but the 31-year-old Russian mogul is dead serious about neuroscience, android robotics, and cybernetic immortality. He has already pulled together a team of leading Russian scientists intent on creating fully functional holographic human avatars that house artificial brains which contain a person's complete consciousness - in other words, a humanoid robot. 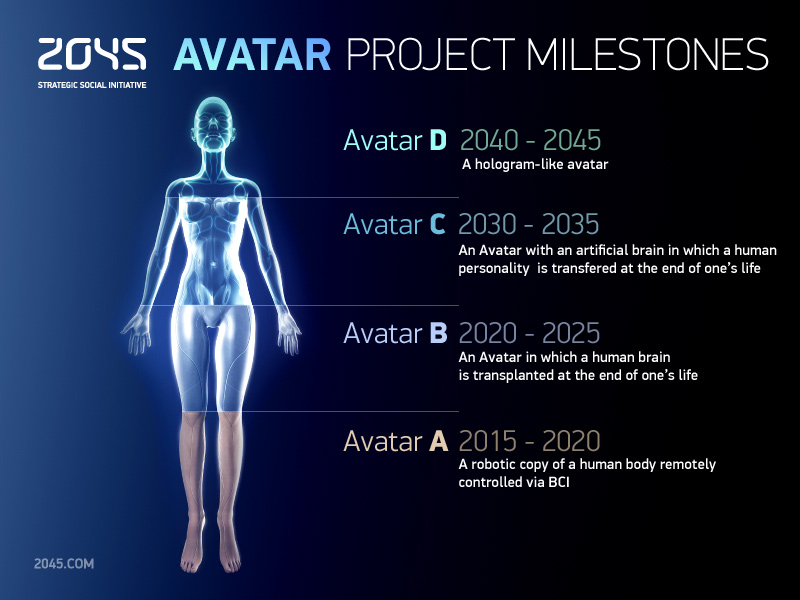 Together, they've laid out an ambitious course of action that would see the team transplant a human brain into an artificial body (or 'avatar') in as little as seven years time. Now, Itskov is asking the world's richest people for help in financing the project. In exchange, he's offered to coordinate their own personal immortality projects for free. "I urge you to take note of the vital importance of funding scientific development in the field of cybernetic immortality and the artificial body," he writes in an open letter to members of the Forbes World's Billionaires List. "Such research has the potential to free you, as well as the majority of all people on our planet, from disease, old age and even death." Itskov goes on to offer skeptics a meeting with "a team of the world's leading scientists working in this field " to prove the viability of the concept of cybernetic immortality. Science Magazine points that phase one -- creating a robot controlled by a human brain -- is already well within reach. "DARPA is already working on it via a program called "Avatar" (which, incidentally, is also the name of Itskov's project) through which the Pentagon hopes to create a brain-machine interface that will allow soldiers to control bipedal human surrogate machines remotely with their minds," writes PopSci's Clay Dillow. "And of course there are all the ongoing medical prosthesis projects that have shown that the human nervous system can interface with prosthetic enhancements, manipulating them via thought. Itskov draws a clear arc from what we have now to the consciousness-containing holograms that he envisions. All we have to do is attack the technological obstacles in between, one at a time, until we get there." Discovery's Alyssa Danigelis takes an opposing stance to the very idea. "There's a world of difference between pursuing a brain-controlled exoskeleton to help paraplegics regain control and wanting to essentially upload a human brain into an artificial body," she writes. "I read a sci-fi novel involving disembodied live brains once. It didn't turn out well"
What's your reaction to this pursuit? If you had the opportunity to live forever - albeit cybernetically - would you do it? Would you opt for cybernetic immortality if it existed within your lifetime?